Last month our avid fundraiser David Stone ran the Virgin Mini London Marathon – the last three miles of the marathon. 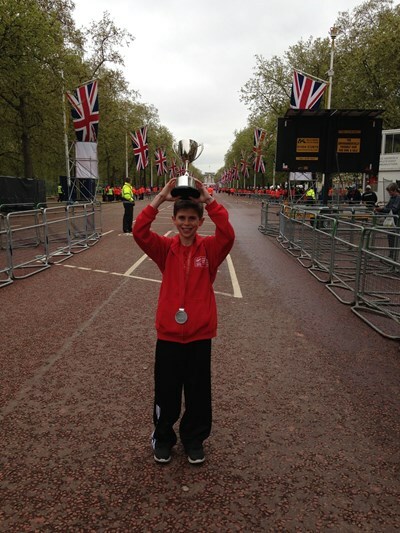 He ran in the Under 13s age group and finished his three miles in 16 minutes and 12 seconds, making him the winning runner from the London Boroughs, and sixth overall. He received his trophy live on TV from Spurs and England footballer Andros Townsend. We are so grateful to David for raising nearly £1,000 for the Duchenne Research Fund. Congratulations on your trophy!